So cute! I love the car icon! 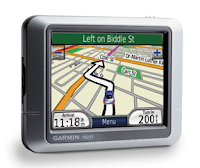 Garmin makes a really nice product (I've used it in rentals cars), so I'm sure your love for it will only grow. I just bought a TomTom (for similar reasons) and I LOVE it. I picked a British woman's voice who tells me to merge onto the motorway, which I think is a hoot! Definitely one of my best investments. Chris gave me the same Garmin model for my birthday. I absolutley love it! We're planning to use it (with AAA's TripTik as back-up) to get us out to COlorado in a couple of weeks. Oh, yeah...also just bought the new iMac. Love it too! We'll have to "ichat" sometime! We just got home from Vermont and, well, it wasn't the best (sometimes she- still unnamed- wanted us to go very off-course back roads). We just turned it off when we were some place that we knew a better route. Oh, well. I guess everything can't be perfect! But, with a British accent it might be more forgivable. Still, very pleased to have it, and looking forward to testing it in Boston next week. ps- and welcome to the wonderful world of Apple, Ali! It's so much more visual and user-friendly than PC. You'll wonder why you didn't switch sooner! Congrats! Also, it sounds like you have a move-date planned to CO? I must see you before you go!! !